The final phase of my yard makeover is the south yard which is a much smaller space. I thought it would be a good idea to grow stuff you can eat. So, a month ago I built two raised garden beds. I needed some place to put extra dirt in order to finish my path and patio areas. But, now that I’m done with that, and January is in full swing, it’s time to start the veggie and herb garden. 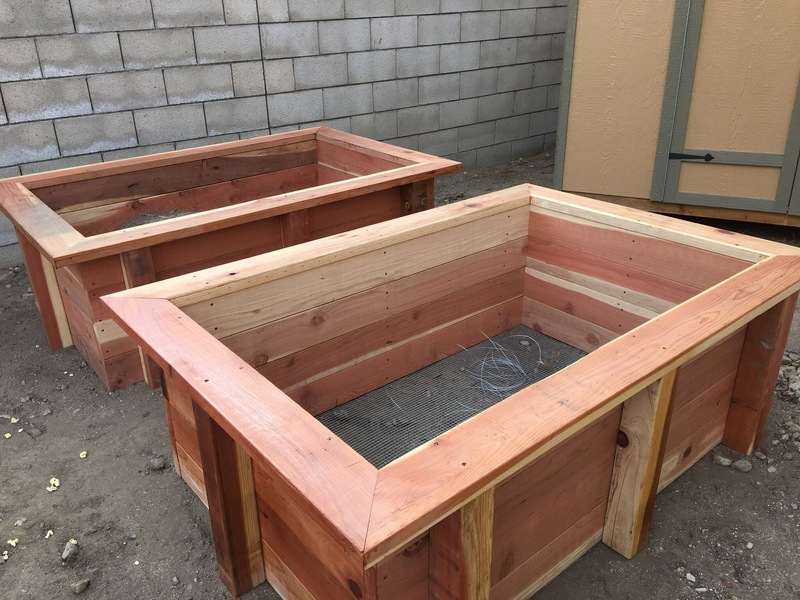 Raised garden beds that need filling. I bought some seeds from Baker Creek Heirloom Seeds and I got a little germination station, some seed soil, and a grow light (well, the light is on the way). I also got some garden soil and steer manure from Home Depot. I’m going to mix my native soil, which is actually pretty loamy, with the garden soil and manure. Then, my plan is to water it and see if I can get weeds to germinate so I can get rid of them. Meanwhile, I’m going to use my germination station to get seeds started indoors. Anyway, I will then start some carrots, lettuce, broccoli, garlic, and onions. Then, in a couple months, the warmer crops will be starting. For now, I will hand water. But, soon, I want to get a micro-sprinkler system going over there. I have to put pressure regulator on the line that feeds the sprinklers on that side. Then, I will use the existing piping and add to it to have irrigation go up to my beds. I will cap off the other sprinklers there because there’s nothing but my shed and dirt over there. Long term, I’m going to to sift a bunch of rocks out of the top six inches of soil and put them on top as ground cover in most of that area. And maybe add another raised bed. Then, I will get at least a lime tree and avocado tree. After that, maybe, but not for sure, a dwarf orange tree. That might be all the side yard can handle.